Pat Wictor stands out in a crowd. 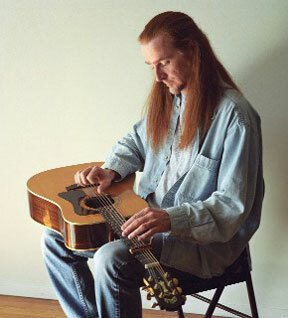 With flowing red hair and zen-like calm, he sings in a pure voice and makes his instrument, the lap-style slide guitar, " sing" back to him. He can bring a room to silence, weaving several parts on his guitar and reaching quietly into each listener's heart. And his songs, drawn from the deep wells of rural blues, gospel, and country music, linger in the mind long after he's done. Pat will be joined for this performance by Jen Schoenwald and, Cheryl Prashker of Full Frontal Folk..